ThingWorx delivers IIoT applications and solutions built on its market-leading technology platform—all designed to accelerate digital transformation. ThingWorx delivers purpose-built industrial IoT applications and the market-leading technology platform, so you can rapidly deliver solutions that solve critical challenges in your industrial business. Ensure connectivity to devices, applications, and data sources across your organization. Access industrial IoT and application data from on-premise web servers, off-premise cloud applications, and hybrid environments for ultimate flexibility. Create robust industrial IoT solutions—faster and more easily than ever before. Harness deep functional capabilities and our robust IIoT partner ecosystem, to develop feature-rich IoT applications that maximize your return on investment. Use ThingWorx to manage connected devices and control processes. Leverage out-of-the box functions and applications to ensure optimal performance of assets and operations. These capabilities provide substantial value in the form of increased uptime, reduced costs, role-based visibility and control, and improved compliance. Industry leaders have already transformed their operations with the ThingWorx IIoT platform. Read their stories here. HIROTEC relies on ThingWorx connectivity to deploy IIoT solutions that are deeply integrated with its manufacturing system. With next-generation service and product capabilities, Sysmex is improving business processes and outcomes across the enterprise. Parata Systems distances itself from competitors by using predictive analytics to revolutionize customer service. Managing the unprecedented volume of data generated by today’s devices is both critical and challenging. ThingWorx uses sophisticated artificial intelligence and machine learning technology to turn industrial IoT data into insights. Using automation, these insights can power platform applications, human processes and AR experiences. Analytics and machine learning dramatically improve the downtime prevention, visibility into performance, and automation controls. Learn more about the strategic role that Analytics can play in your IIoT strategy. Explore the benefits of ThingWorx-driven analytics automation, including how to can explain and predict outcomes, and how you can build powerful analytics solutions—even if you lack in-depth data science expertise. In this webcast, you will learn how to begin your analytics journey with remote monitoring and how to strategically develop predictive analytics capabilities. Gain an in-depth understanding of the next-gen digital tools and platforms that are providing industry leaders with deeper analytics through remote monitoring, and how these new business processes are delivering value. The IIoT has tremendous potential to inform our decisions and improve how we work. But much of that potential depends upon effectively sharing the right data, to the right people, in the right format. ThingWorx provides a spectrum of user experience options that make sure that people can engage and leverage the industrial IoT—including a seamless integration with Vuforia AR. Explore how ThingWorx can streamline your next development project. 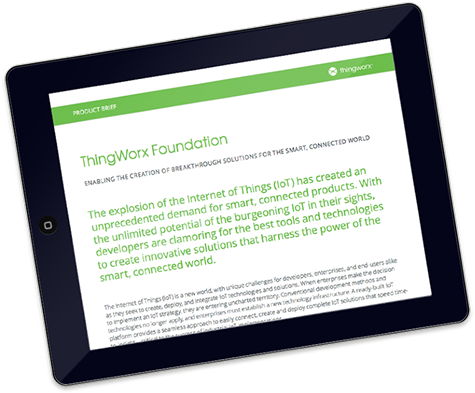 Sign up today for the full ThingWorx free trial, and access our vast library of projects and guides. ThingWorx Apps provide out-of-the box insights into asset status and performance data. Start your free trial, and get role-based visibility into your equipment in under an hour. With hundreds of community-built apps, connectors and market-ready solutions available, use the Marketplace to fast-track your implementation, or to promote your IIoT offerings to a wider audience. Want to learn about how IIoT can transform your business? Have questions about the ThingWorx platform. Curious about subscription pricing? Get in touch.